Todo es possible con Enrique! | ViVa! Todo es possible con Enrique! An early start for me this morning as a lady taxi driver called at my hotel at 8am sharp to drive me to the Sayta Ranch – just an hour’s drive away from the dusty, colonial town of Salta, in the North West of Argentina. On our way, we stop to pick up another two backpack girls who are staying in a hotel close by, and who, like me are eager to experience a real Argentinean ranch. I soon come to realise along the way that we have more things in common than simply a passion for horses. What a relief to see that the girls are actually French! We speak along the way in the taxi and I am happy to practise the language after a week of almost complete abstinence. I also note, for the first time ever, a certain sense of belonging whenever I meet someone French. It was the same feeling I used to have when I lived in Italy and met Italians away from the ‘bel paese’. My stint in France is gradually leaving a mark on me. We finally approach a dirt track some 2 km long. Along the way, I can see inquisitive dogs coming out of the gates they guard, to greet us, followed by their masters who gaze at us with as much the same sense of curiosity as their guard dogs. There are domestic animals of all sorts and sizes, ranging from the menacing Alsatian dogs to geese, cats and cockerels, all seemingly living in harmony in this tranquil and forgotten rural corner of mighty Argentina. We finally turn left to a private alley way, leading straight to the ranch, and there we are greeted by Laura, a charming and sophisticated lady in her 30’s, who walks us in to introduce us to the other guests who are already having breakfast, in a vast shed overlooking a well proportioned courtyard. The shed is decorated by all things horses – saddles, horse shoes, and other tools now replaced by more modern or newer gear, adorn the walls of this welcoming shed. A long and very solid-looking table stands as the centre piece of the room, whilst a barbeque fire at the entrance into the shed gives away the function of the shed – which has now become the eatery and the meet and greet place for the guests arriving at the shed. Introductions done, in German, French, English and Spanish, we are now invited to a quick cup of tea and some cake, following which we are off to the stables close by, home to some six horses, which have already been prepared and are ready for riding by our instructor – a real Gaucho. The gaucho looks tough and strong, a no-nonsense kind of guy who has been clearly brought up on the ranch, and whose life is centred around the horses. He refuses to speak any language other than Spanish. I am assisted by a German intern on to the horse. ‘Non tiene!’ – I can hear the German boy whispering to the gaucho, with a slightly mocking tone of voice implying ‘here we are, we have another European idiot who comes onto the ranch with no idea of horse riding!’ I was reassured to hear the guacho’ reply – ‘No problema!’ With his mindful watchful eye, and his trained horse never far from me, we certainly felt safe all along the way. The route we followed on horseback was nothing short of spectacular. There is no better way to admire the landscape than from a horse. It actually felt as though I was a part of the landscape, and not simply a spectator looking from the outside. Horses are at one with nature. They are creatures which I respect for their strength and intelligence, and for the fact that they can easily hurt man if they wanted to, but they don’t because they choose to co-operate instead. Riding in Argentina varies a little from riding in Europe. Here, you hold the reins with your left hand, you leave your right hand free to balance. The inexperienced and less confident riders like myself are naturally inclined to hold on to their saddle with their right hand. However, the more seasoned riders sit on their horses with great elegance, holding their right hand in the air and simply in perfect tuning with the movement of the horse. It is incredible. Horse and rider become one. Seeing Laura galloping was a real treat. The way she does it, simply holding on to the reins with one hand, and the other placed on her gaucho hat, is indeed a very elegant way of riding and truly shows how well she masters the horse. The day was pleasant – blue skies prevailed, and a sense of peace took over as we watched in awe the Andes mountains, their summits cuddled by rich-textured white clouds. The moment we passed through a stream on horseback was also very special. 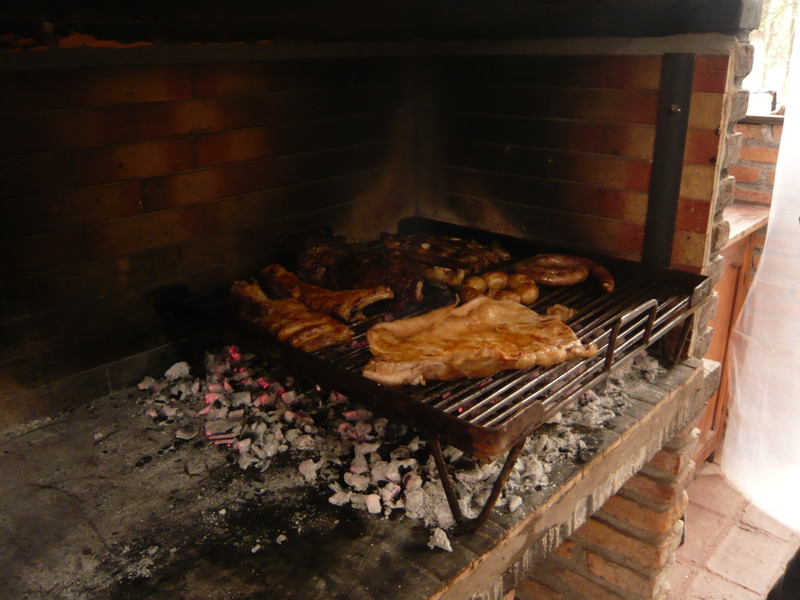 Upon return to the ranch around midday, we found Enrique, the owner of the ranch, holding a glass of red wine and placing very generous slabs of meat on to the barbeque fire which was now glowing. Enrique is the man behind the entire operation. His passion for horses is evident. Here is a man who has always nurtured a love for horses, but who never thought of running a ranch professionally had it not been for a twist of fate and a change in his life circumstances. In fact, I soon learnt that Laura was his daughter. It was her who told me that her father did not do this all his life, contrary to what I imagined or indeed expected. It was only after his wife’s death some eighteen years ago that Enrique started to spend less time in Salta and more and more time at his retreat in Sayta. Eventually, his best friend convinced him to start a new chapter of his life and work with horses. Thus the Sayta horse ranch was born. Twelve years ago, he started by distributing a hundred flyers in town. People started flocking to the ranch to meet Enrique and spend some time on the ranch with horses. Gradually, the ranch was expanded and people could now stay over for a few days and stay in the cottage houses on the ranch itself. For the day trippers, a morning riding session is followed by the sumptuous barbeque meat grill. The experience is complete, and although the ranch is today a commercial activity receiving scores of guests every day, the welcoming feeling remains personal. Enrique certainly oozes charm the minute you see him. He is the real soul of the ranch. Of Irish, English and Portuguese descent, he has certainly taken more of his Latin origins than his Anglo-Saxon ones. He does not speak in English, so we communicate in Spanish and in Italian. As he puts it, language in Latin countries is only 30% of the communication process. The rest is gesture and facial expression. Sadly, I could not stay on for lunch on the ranch. My 20-hour bus ride to Mendoza was already booked in the afternoon, and I had to make my way back to the bus station and go on with my journey. I did, however have the chance to speak to Enrique for a short while, and invited him to visit me in Paris, so we could make up for the lunch I was missing. As I sat in the taxi to head back to town, I realised that Enrique will probably never accept my invitation to travel to Paris. 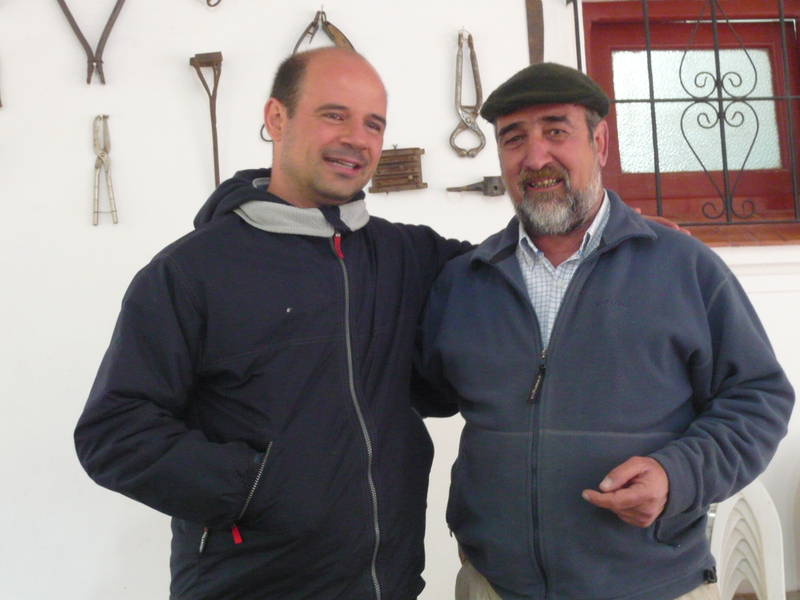 He belongs to the ranch…..and to Argentina.